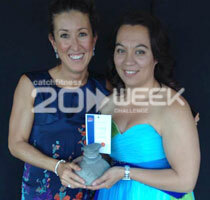 The Diamond Mine Overall Award is given to an entrant who fully embraces the 20 Week Challenge philosophy. They may not win a category or even be a finalist but they do give the challenge their all and that’s certainly what Leea Hirst did. 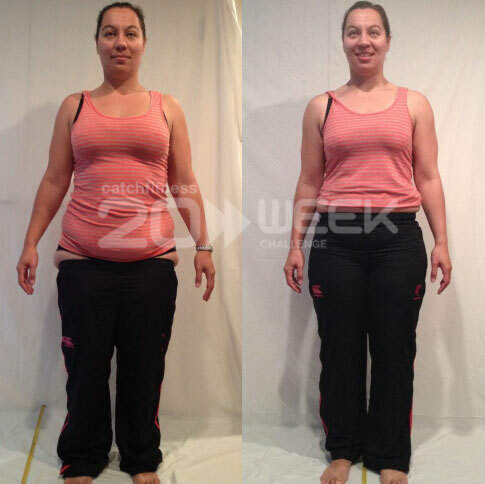 Leea did in fact do great in her fitness tests (see the graph below) and she also lost some 8.7 kg during the 20 Week Challenge (having lost a total of almost 40 kg since her journey started back in February 2013) but it was her fun, have a go at everything, nothing was going to stop this girl, attitude – mixed with buckets of gratefulness that had scored the judges attention from the outset and continued to keep us all entertained and inspired throughout the 20 Weeks. 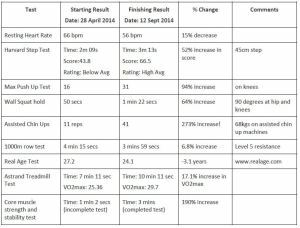 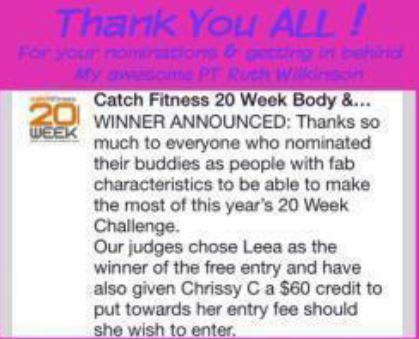 Click on the pic to enlarge and see Leea’s fitness test results. Leea also did all the mini solo challenges along the way including the Tri July which encourages entrants to do an ‘Ironman’ over a month. 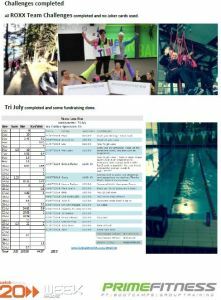 ‘…Tri July for me was a great way to participate in the national fundraising known as “Dry July” no alcohol for the month with all proceeds going to cancer. As I was already “Dry” I set up my own fundraising page and raised $440.00 for the local Cancer Society, so it was really lovely to give something back. 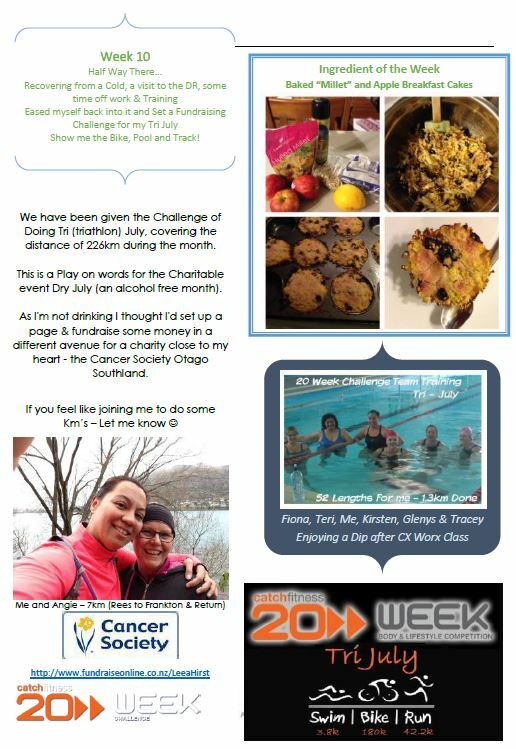 Leea wrote in her journal every week and kept us all updated with how she was getting along,the good and the bad, via her Facebook page ‘… Cranking through the second half of the challenge seemed to go so quickly and then in August I felt like I hit a little bit of a lull, tried on my item of clothing from photos (a brand spanking new pair of pants that I won at a Silver Ferns tournament) and I could pull them up! 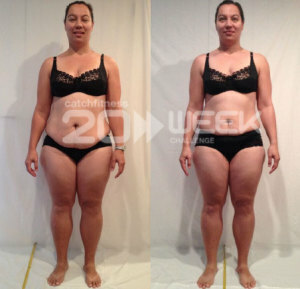 This gave me an injection in motivation and that lull was soon gone. 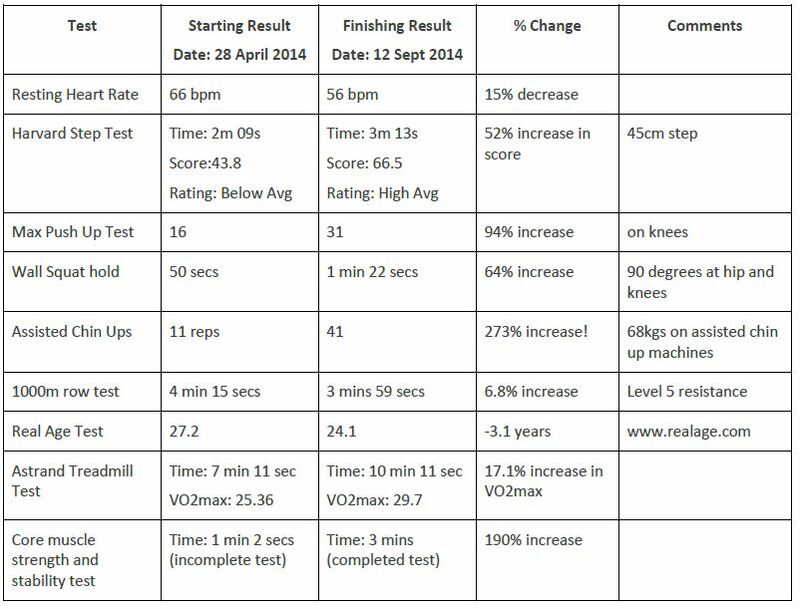 Fitness testing is done again and I am so pleased with all of my results and as I mentioned to Ruth, it doesn’t matter if I didn’t go as far as I had hoped in my head (aiming for times or figures) it just means I have something to aim for in my next lot of fitness testing…..
…Weekly team training with Ruth and all her 20 Week candidates has to be a highlight of my challenge, sharing the experiences and motivating each other through sweat is hard and great all at the same time. These ladies are AMAZE-ing…. Thanks to Ruth, my 20 Week Team Prime, my support network and Catch Fitness for letting me be a part of the journey! 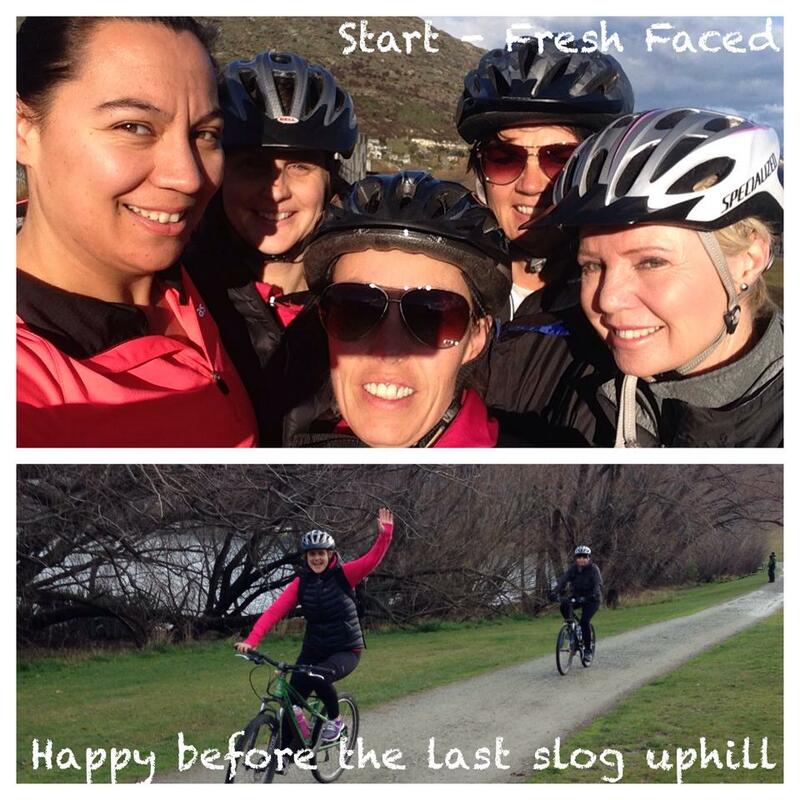 If you are ever on Facebook – swing by my “Journey by Leea” page as I tackle my next set of goals.’ – Leea. 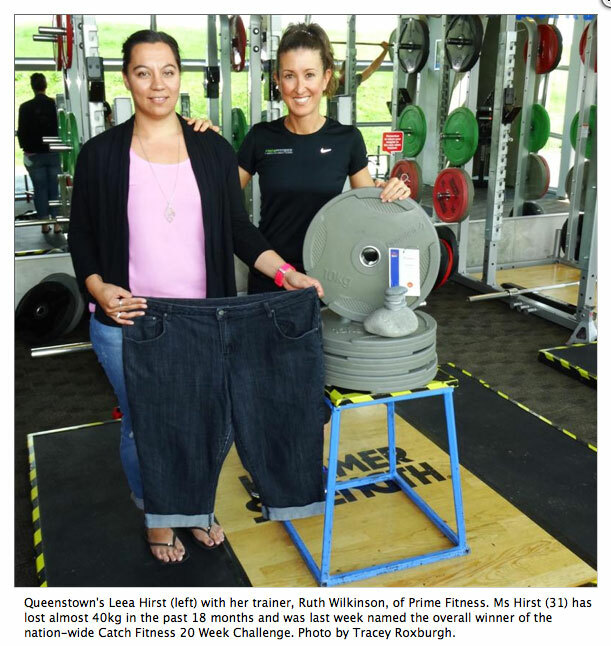 Read the article about Leea in the Otago Daily Times.